The Opera 17 features innovative functions for saving energy. Such functions, combined with its radiant heating technology, make the Opéra 17 the ideal radiant wall heater for those seeking beautiful, smart and economical heating. Available in wattages of 500 to 2000W, the Opera 17 heats while creating the sensation of soothing warmth, like the effect of the sun’s rays. Its soft enveloping warmth is diffused throughout the room. A choice you won’t regret. The exteriors of our radiant heaters are designed to diffuse heat in the best way possible. The Opera 17 therefore features a honeycombed exterior, enabling the heating element to better diffuse heat throughout the room. Modern in design, the exterior contains an absence detector, a very useful tool for economizing energy. Thanks to the Opera 17’s electronic back-lit thermostat, which is ultraprecise to 1/10°C, and its thermal sensor, located 6 in. from the floor to detect the coldest air, you will enjoy in a stable, precise and consistent environment. The Opera 17 is endowed with many smart functions, such as an absence detector, which gradually and economically lowers heating when it no longer detects human activity in the room. Finally, the Opera 17 features a smart thermostat with many programmable functions, for better comfort and energy economies. The Opera 17 is designed to be as safe as possible. Its corners are rounded and heating elements inaccessible to children’s fingers. 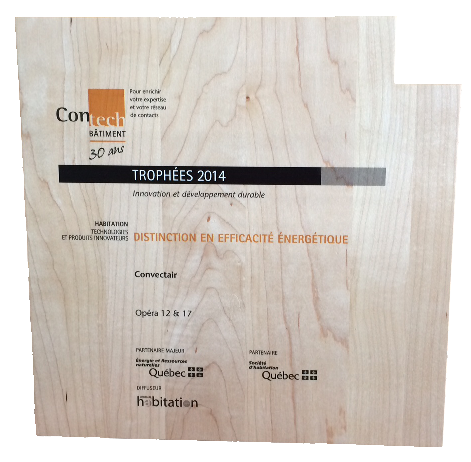 The lockable thermostat is endowed with thermal protection in cases of overheating. The Opera 17 is available in 500 to 2000W. Calculating the wattage of your heating needs is essential. Making the right choice will bring you optimal comfort. To determine the necessary wattage, go to the “Wattage calculator” section. 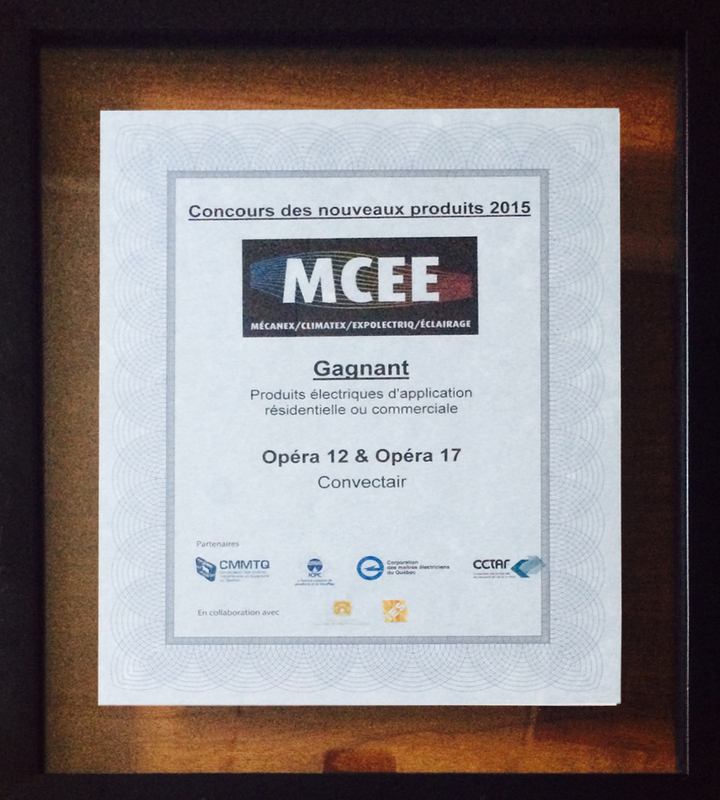 Convectair is proud to announce that its Opera 17 and Opera 12 units received the first prize for a new product in the " Residential or commercial applications electrical products" category at MCEE trade show, held in Montreal last April. 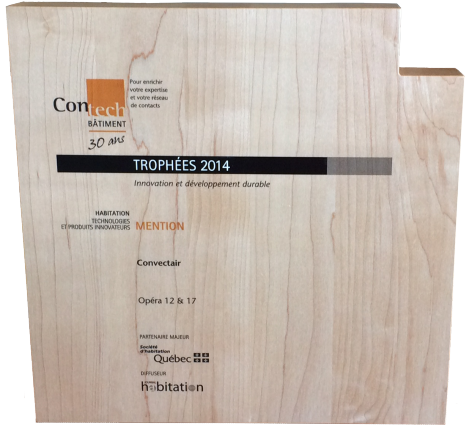 Convectair has won two awards for its Opera 17 and 12, at the Contech show in November 2014 : a mention in the "Technologies and innovative residential products" category and a jury distinction in the "Energy efficiency for residential products" category. Programmer : Control panel designed to accept the Programmer module (7392).. Location : On top right-hand side of the unit, with lockable protective cover. Mode button with five settings: Comfort; Economy; Frost protection (45°F (7°C)); Program (automatic setback when connected to the Convectair Programmer); Absence detector (setback when absence detected). Recommended installation height : 6 in. (15 cm). Clearances : Front: 30 in. (75 cm) - Sides: 8 in. (20 cm) - Above: 8 in. (20 cm) - Bottom: 1 in. (2.5 cm).